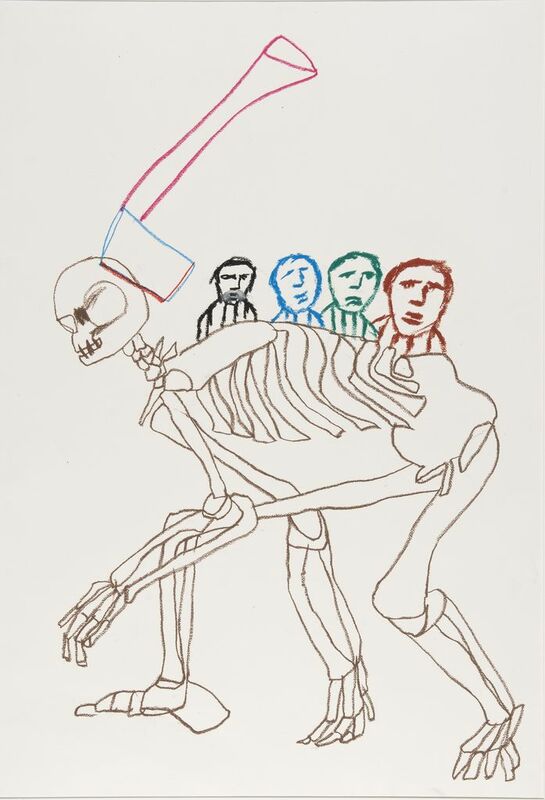 For the term of his natural life comprises 31 drawings Sidney Nolan produced over a period of just one week in August 1978. They were inspired by a celebrated novel (originally titled His Natural Life) written by Marcus Clarke and published in 1874, which is one of the earliest semi-fictional accounts of convict life in Australia. The novel tells the story of a young man, Rufus Dawes, who came to Tasmania as a convict for a crime he did not commit, and it graphically describes the inhumane conditions convicts were subjected to in Australia. The story has since been interpreted in a number of ways and has been adapted for the stage as well as film. Nolan had a keen and enduring interest in literature, Australian history, and in the idea of the tragic hero. He was intrigued by the story of Rufus Dawes, and in only one week the artist produced this collection of drawings which vividly recounts aspects of the story. Nolan focuses on key events and themes in the book which have universal significance relating to human suffering and survival. Several drawings convey the brutality with which convicts were treated, and they also depict the sadistic nature of the convicts themselves, some of whom were ultimately driven to cannibalism, signified here by the skeletons. In some works the artist refers to earlier paintings, including Mrs Fraser, a series which also reflects on issues of human survival.